Whether your using a PC or a Mac, there are now more audio interfaces currently available from numerous manufacturers than you can shake a stick at. It’s the usual story of there being essentially far too much choice and yet many of the audio interfaces available, especially, for the home studio, are very similar in their capabilities and audio specifications. With this in mind, I’m going to narrow things down a little in this article and look at a couple of the more innovative interfaces, as well as considering the key specifications you should think of as ‘must-haves’. Project studio or home users trying to record multiple inputs, such as those from a complete band or an acoustic drum kit will need an interface with numerous microphone inputs so that each channel can be recorded onto a separate track for individual mixing and editing. One way around this is to sub-group and record (e.g. 4 inputs to one track), however this places serious limitations on mixing the mixing stage. For example, if you subgroup a drum kit, you will end up applying the same EQ and dynamics applied to a cymbal, snare and bass drum. All of these components have drastically different characteristics and therefore need in the ideal world to be treat individually, will detailed EQ/Gating/Compression as opposed to what otherwise will amount to a generic gloss. The down side to this is that you need an audio interface capable of handling numerous inputs, which puts you pretty much at the top of the tree in terms of cost, e.g. 8 microphone preamps with expansion capabilities. In addition, if you are recording in the fashion, you will be doing all your audio mixing and streaming within a host machine. This places serious stress on your computer and can lead to the clicks of doom when you start to throw too much at your machine. One way to avoid over stressing the host PC or Mac is to limit them to handling just the audio streaming and to add an accelerator DSP card, e.g. Universal Audio range of UAD products. These highly useful products come bundled with a comprehensive effects, EQ and dynamics software plug-in suite, with a significant difference to standard software packs. DSP cards actually run the plug-ins as opposed to the host PC/Mac, which simply lets you get the most out of your host computer. However, this requires users to install a PCI card, which can sometime conflict with host setup, or add clutter your firewire card, which no doubt will be a 400 series adaptor. 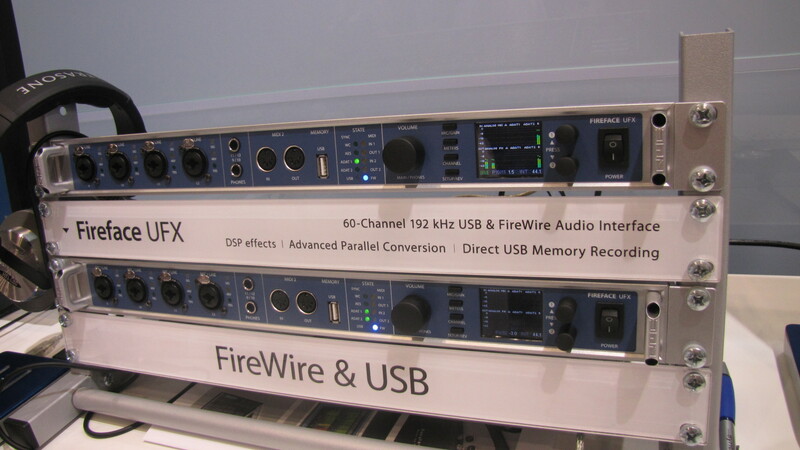 To circumvent these issues Universal Audio recently released the Apollo range of FireWire 800 audio interfaces. There are two models in the current series, Apollo Duo and Apollo Quad. Both feature the same input output configuration (18×24), offering 4 premium microphone preamps, which can be expanded to 16 via a suitable ADAT compatible microphone preamp, offering more than enough inputs for the serious user. Not only does the Apollo range offer compatibility with the higher bandwidths of the Firewire 800 protocol, they also feature an internal UAD2 series DSP accelerator card and plug-in suite PC/Mac based processing and mixing. Apollo Duo features the UAD-2 Duo and Apollo Quad offers double the power of Duo via a pre-installed UAD-2 Quad DSP accelerator. Both units come bundled with the “Analog Classics” Plug-in pack, which includes LA-2A Classic Audio Leveler, 1176LN Limiting Amplifier, and Pultec EQP-1A Program Equalizer. This range allows users to get more from their existing setup, since the card takes all the hammering and stress of running dedicated software plug-ins as opposed to the hosts’ CPU. The result simply offers additional headroom and allows for streaming more channels of audio, or whatever, before the pops and clicks of doom start to appear as you hit the buffers. In addition, you can generally get away with low latency settings and improved system performance as the card takes the weight instead of you’re PC/Mac taking all the abuse. As for the quality of the input stage, Universal Audio’s name is synonymous with high-end analogue microphone preamps, channel strips and professional signal processors designed for studio grade recording applications. So there’s certainly not going to be any issues there! As for configuration, Apollo Duo and Quad feature offers 8 analog inputs (including 4 pristine mic preamps) along with ADAT and SPDIF. The digital output stage mirrors that of the input (ADAT plus SPDIF), however 8 analog outs are also accompanied by dual headphone outs and a separate monitor out. Apollo Duo and Quad are also compatible with Intel’s new Thunderbolt technology and the optional Thunderbolt card, which provides lower latency, reduced audio buffer size, improved performance and more UAD plug-in instances than versus FireWire. Note that initially Apollo will only support Mac OS, with Windows 7 support arriving by spring/summer this year. So, if you’re looking for a premium audio interface to help take the load off your existing PC/Mac host computer, then I would take a serious look at the Universal Audio Apollo range of FireWire 800 interfaces. This makes even more sense when you consider the need to have rock-solid support and upgrade paths for the future – something that UA has been committed to for years now.